A common misconception of Las Vegas is that the city has little art and culture of its own. The Downtown Arts District has sought to change that notion while providing an exciting home for galleries, retail, antique shops, vintage clothing, restaurants and nightlife. 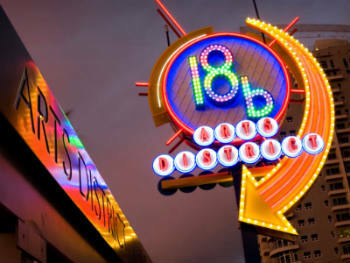 The area is officially known as 18b The Las Vegas Arts District, as it originally spanned 18 blocks throughout downtown Las Vegas. While dozens of art studios are open throughout the week, the district really comes alive on First Friday, a monthly street festival featuring artists, musicians and food vendors. During the rest of the month, 18b is popular in the evening as artists, bar hoppers and even tourists roam the area for trendy eateries, local theater and music. 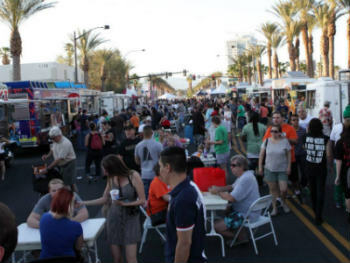 The Arts District was formed in 1998 as a non-profit initiative to develop what it calls “the hippest district in Southern Nevada” by promoting art, business and residential growth. This initiative was vital in helping to convert old warehouse and loft space into galleries and studios in the area. The center of the district is marked by the cross streets of Charleston Boulevard and Main Street, which is less than a mile south of Fremont Street. 18b is home to a pair of high-rise apartment buildings that stand out among the relatively low skyline. Visitors will also notice that several buildings are adorned with elaborate graffiti art. 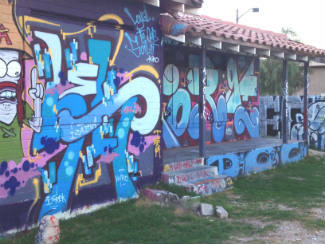 Rather than ruin the buildings, this graffiti reflects the culture of the neighborhood. The area has been historically home to several old businesses and factories. For example, the old Holsum Bread bakery is located in the heart of the district. This building is now home to lofts, studios and a restaurant. Those looking for casinos and big hotels will be disappointed. The Arts District is a place for local Las Vegas culture. Naturally, the arts district is the best place in Nevada to check out the work of local artists. Located on Charleston Boulevard, The Arts Factory is perhaps the most visible gallery space in the area. The building was formerly a warehouse before being converted into studios for a wide range of artists. There are over 20 commercial art-related tenants in the Arts Factory, including a roller derby skate shop, hair salon, yoga studio and various galleries. There’s also visiting artists, a main common gallery as well as a space for musical concerts, poetry readings and theatrical performances. Check the Arts Factory listings for studio business hours. Art seekers will find more galleries in Art Square, which is right behind the Arts Factory. Art Square consists of three remodeled buildings originally constructed in the 1950s as well as an outdoor art garden that was converted from a barren tarmac lot. 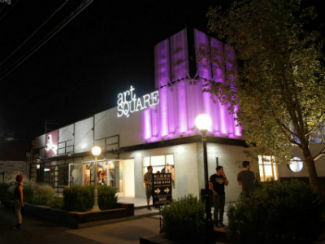 The facility features more than 15 creative, retail and professional tenants, including the popular Art Square Theater, which is home to the Cockroach Theatre. This local theater troupe performs intimate/independent productions at Art Square regularly. For those who want to check out freestanding galleries with works by various artists, visit the Contemporary Arts Center and Blackbird Studios. Both are located near the southern end of the Arts District (less than a mile from the north end of the Strip). Check back often at these galleries as new exhibits and artists are featured. The Arts District is home to various trendy eateries and bars that match the creative vibe set by the neighborhood. For great Cajun food, there’s perhaps no place better in the city than Lola’s Louisiana Kitchen, which inhabits a space at the old Holsum Bread bakery. Mingo Kitchen and Lounge operates inside Art Square and is known for its creative dishes and Sunday brunches. Likewise, the Arts Factory next door has its own eatery, Bar+Bistro, which is decorated with various paintings and sculptures. At night, the Arts District becomes a happening place for bar hoppers. Artifice, which is connected to Art Square, is a popular venue known for showcasing local bands. Other trendy bars within 18b include Velveteen Rabbit, which features an array of craft beers and unique drink concoctions, and The Lady Silvia, a speakeasy type establishment that’s “hidden” inside the Soho Lofts. Without a doubt, the Arts District is at its busiest during the monthly First Friday street festival. This event is held in the district on the first Friday of every month and draws nearly 20,000 people to the neighborhood. In addition to every gallery and studio being open and ready for business, various other artists and creative retailers set up outdoor booths. Visitors will also find various food trucks, performing artists, live music and other activities set up along Main Street. The festival generally runs from 6 p.m. to midnight, during which the city closes off part of Main Street and various other side streets just south of Charleston Boulevard to pedestrians only. Parking with shuttle service is available at the Clark County Government Center. After the festival ends, the party continues in bars and venues across the Arts District and Fremont Street. As First Friday has become more popular, the 18b neighborhood association set up Preview Thursdays for the day before First Friday. This event allows serious art collectors to check out the openings and galleries without having to deal with the crowds on First Friday. Galleries use this preview event as a chance to debut new work. The Arts District is conveniently located a mile or less from the Fremont Street Experience, Smith Center, Las Vegas North Premium Outlets and the Stratosphere. While walking is certainly an option during the day, it is generally recommended to drive or get a ride at night. Free parking is available in a large, yet somewhat disorganized, lot behind the Arts Factory. Smaller free lots are located at many of the bars and antique shops in the district. Just north of Charleston-Main Street intersection, one will find the “18b” neon sign standing at the conveniently located transit station. This stop provides access to the Strip & Downtown Express and is perfect for those opting for a bus pass.